Nostalgia in an 8x4 loaf pan, meatloaf is one of those classic comfort foods that never goes out of style. And whether you love your meatloaf smothered in a ketchup glaze, studded with veggies or in miniature, we’ve got you covered with anything and everything you ever wanted to know about this oldie-but-goodie dinner dish. Well, it’s a loaf….of meat. There’s more than one way to make a meatloaf, but typically this dish involves a mixture of ground meat, seasonings and something called a panade (more on that below). It’s baked in a loaf pan and served sliced, often glazed with a sweet and tangy sauce on top. You can make meatloaf with any ground meat, including beef, pork, veal, lamb, turkey and more. Sometimes recipes (like our Home-Style Meatloaf with Maple Glaze) will call for a mix of two or more kinds of meat, which is a nice way to punch up the flavor. It’s also fun to play around with adding different vegetables to a meatloaf. Our Zucchini Meatloaf disguises veggies from picky kids, and adding minced mushrooms and fresh herbs can give a meatloaf a lot of savory umami flavor without changing the texture. Though it has a reputation as a quintessentially American meal, the history of meatloaf can actually be traced all the way back to Rome around 500 A.D. Then, during the Great Depression, meatloaf basically went viral in America. Mixing ground meat with fillers like bread and inexpensive flavor-boosters like mustard stretched rations further during those tight times. Traditional meatloaf hasn’t changed much since, but home cooks and chefs have found so many ways to jazz up this dinner favorite with international flavors, stuffed versions and more. We’ll be walking you through a classic technique here, but if you’re looking for something a little more unexpected, try our Pizza Meatloaf, Cheesy Mini BBQ Turkey Meatloaves or Grilled Cheesy Mini Meatloaves. Panade is a paste made from wet bread. In the case of most meatloaves, it’s bread soaked in milk, intended to add moisture to a meatloaf and help bind it together. Because we’re all about the easy at Pillsbury, we take a bit of a shortcut by skipping the panade entirely and using breadcrumbs instead. It’s still super moist and flavorful! 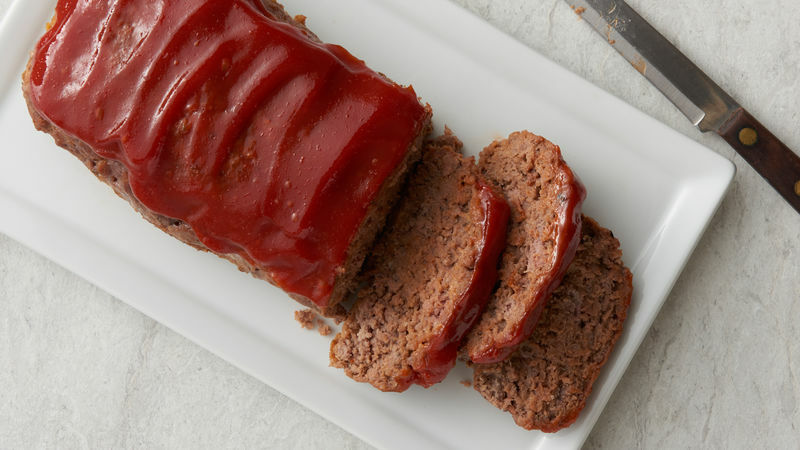 A traditional meatloaf glaze starts with ketchup. You can actually stop there, or add some flavor boosters like chili sauce, yellow mustard, brown sugar, maple syrup, spices, etc. It just depends on your personal taste! After you mix up your glaze, brush or spoon it onto the meatloaf about 15 minutes before it’s done baking. Step 1: Preheat oven to 350 F. In a large bowl, combine all ingredients except the ketchup or chili sauce (we suggest a combination!). Mix well. Step 2: Press mixture firmly into an ungreased 8x4-inch loaf pan. Step 3: Bake at 350 F for 30 minutes. Step 4: Remove from oven and top with 3 tablespoons of ketchup/chili sauce. This is your meatloaf glaze. STEP 5: Bake for an additional 10-15 minutes or until thoroughly cooked in the center and meat thermometer registers 160 F. Let stand for 5 minutes until removing from pan. Leftover meatloaf will last about four days in the fridge. If you’re not sure you’ll be eating it all within that time, throw it in the freezer! Meatloaf holds up very well in the freezer. Meatloaf can dry out when reheated, so here’s how you avoid the parched, crumbly leftover meatloaf stereotype. If you’ve frozen your meatloaf, thaw it first. To reheat for sandwiches, slice the meatloaf, add a bit of oil to a skillet and fry until the internal temperature is 165° F. It should get a little crispy and browned on the outside and that is a very, very delicious thing. To reheat in the oven, preheat the oven to 350° F. Slice the meatloaf and place in a baking dish. Add a small amount of water to the dish and cover with foil. Bake for 20-30 minutes or until the internal temp is 165° F.
Love comfort food? You might also want to hang out in our pot pie section.